Please find below a photographic roundup for February 2016. 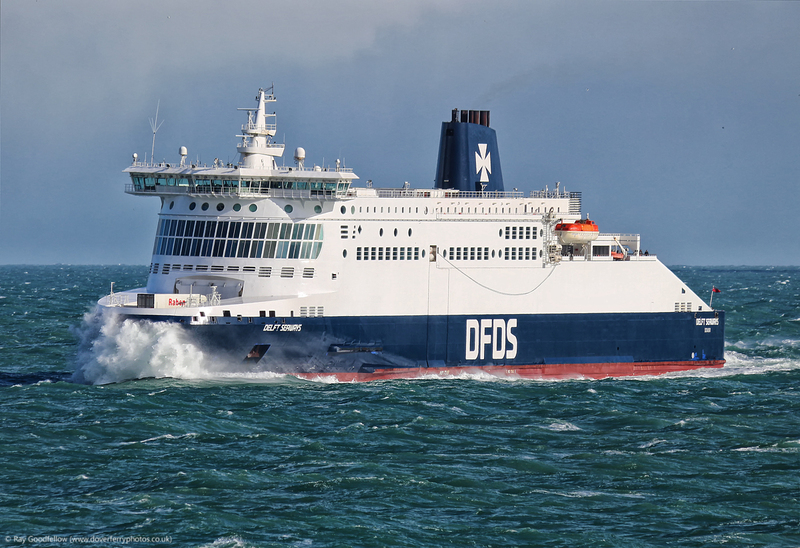 We have been across to France twice so far this month to capture the new liveries of the DFDS fleet and to also experience DFDS’s latest acquisition the Côte des Dunes. The first of our journeys this month took us straight into the teeth of the latest UK named storm ‘Imogen‘ but even though we were ever so slightly windswept and delayed by about 3 hours we made it back home safe and sound. As an industry watcher and a regular cross channel customer it is always a pleasure to sample a ‘new’ ship or to compare it with times past and the ‘Dunes’ certainly did not disappoint. Together with my two travelling companions on the day, we were very, very impressed with the ship, if not a little saddened by an unfortunate incident which beset one of my travelling companions in regards to a rather heavy handed approach to photography on board and it’s perceived threat to the ship’s safety. 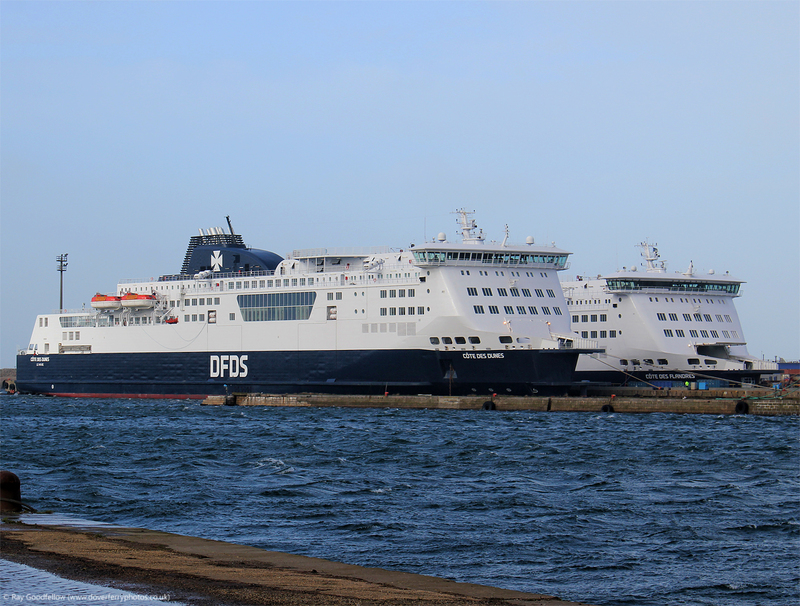 There are many of us online who actively promote the ferry companies and ferry travel using our photographic skills and knowledge to present the news and in our case, the cross channel developments in a positive manner. With little or no support at times we get the footage/information out there for fellow customers to enjoy and this, of course, can be of tremendous benefit to the ferry operators themselves with some free positive advertising. 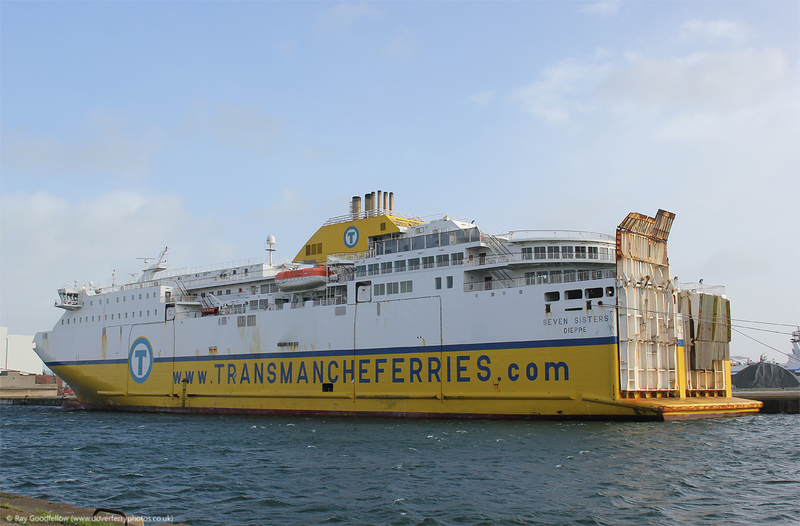 I have personally been travelling by ferry for over 30 years and I have been championing ferry travel and the ferry industry online since 2003. Yes our site is a hobbyists site but people do actually read what we publish (yes I do sometimes find that hard to believe) and I think you would be surprised how big an audience a site such as this can reach. For instance this site has been visited by just over 93,000 unique visitors from 164 different countries who have viewed the sites content just short of 400,000 times in the last 12 months. Our Twitter reach for the last 12 months has been 114,497 impressions (impressions are how many times your tweets have been seen) and as for Facebook it’s too high to even quantify. This is perhaps something the operators should bear in mind, after all, adverse publicity seems to spread far quicker in this day and age of social media than the positive news and the positive impression of ferry travel we are trying to get out to our own site visitors and the operators potential future customers! The thing about being a fare paying passenger is that you have a choice of whom to travel with. Your choices are usually driven by the cost of the ticket but let’s be honest, this isn’t the only contributing factor, well it certainly isn’t for me. The overall experience of a crossing, the food, the service and the way an operator treats their ‘guests’ can also be a major influence when I am making a decision. Having documented my own sea travels since 2003 I have always remembered the good journeys and the great crew members that have made the journey enjoyable. Being in the same frame of thought I am afraid I am going to remember our journey on the Côte des Dunes for quite sometime and not for the good reasons I stated above. However, drawing a line under this matter, let’s get back to the purpose of this post, some photography. 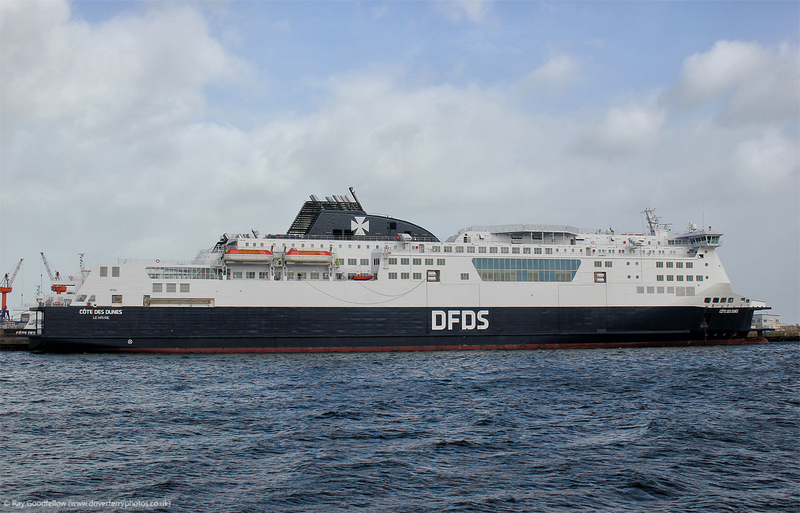 The Côte des Dunes herself will feature in a future update with a before and after photo analysis of the refit. My overall impression of the refit is that it is light and airy and Trimline have completed the work to a very high standard but it will be interesting to see just how well the use of light colours will stand the testament of time on what is after all, the most intensive of ferry routes. Best wishes to you all, apologies for the rant and I hope you enjoy this photographic post. We were originally planning to travel on the Côte des Dunes this day but her entry into service had been delayed by 24 hours. 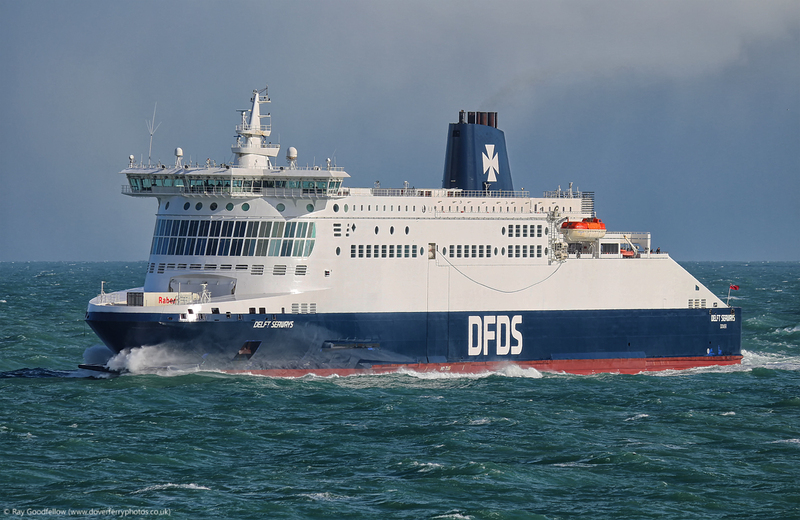 With the day now spare we decided to rebook with P&O Ferries and were scheduled to travel outward on the Pride of Burgundy and return on the Spirit of France, however there was something brewing in the Atlantic which changed our schedule somewhat. As the days passed until our crossing with P&O Ferries the weather forecast continued to worsen as the day approached. We are used to gales living on the coast, they are part of the yearly weather cycle but with this latest system moving in being designated storm ‘Imogen‘ we could expect severe gale/hurricane force. 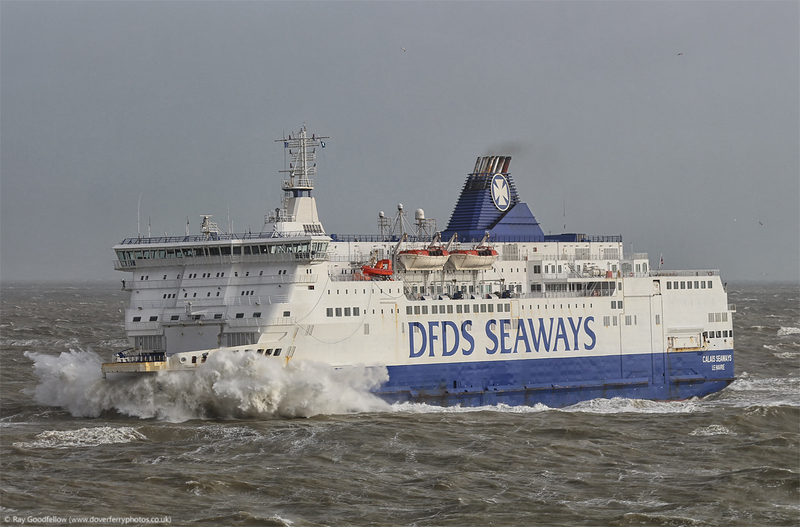 In the evening of the 7th February 2016 the winds started building and by late evening the Port of Dover had been closed due to the severe weather conditions (Winds gusting to force 11). Going to bed that night I was pretty much convinced that our trip would be called off. I woke on the morning of the 8th February 2016 to find that the wind had dropped significantly and the sun was rising over the town, hopefully it wouldn’t be a case of “red sky in the morning sailors take warning”. 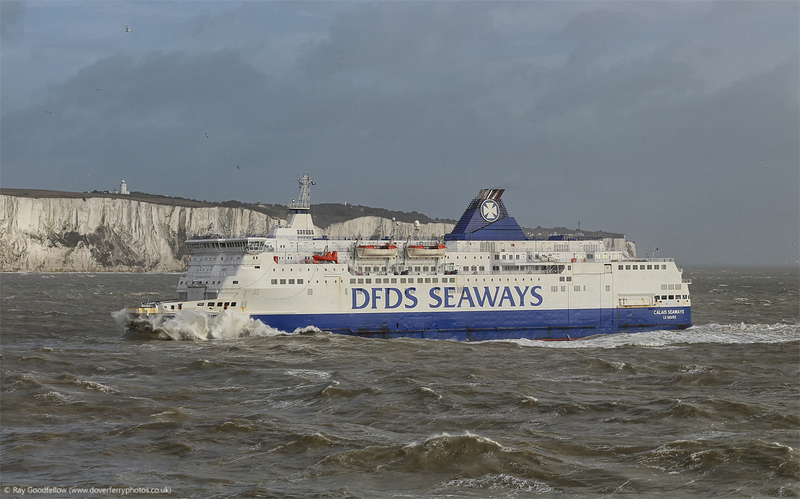 We arrived at the Port of Dover earlier than planned, we were expecting long queues following the port closure the previous night but the port approach roads were eerily quiet. As a consequence we were put onto an earlier crossing, so it was on the 0925 sailing of the Spirit of Britain that would be taking us to Calais. Please don’t get me wrong, I may have painted a picture of it being a beautiful sunny morning but it wasn’t a Spring day in any way shape or form, it was still very windy and there was a heavy sea running, in fact I don’t think I have ever seen a ship moving around so much on the berth as the Spirit of Britain was that morning but we were on board and with a ten minute delay we were soon heading out of the Eastern entrance to the port. The ship was very lightly loaded (sensible people had obviously taken notice of the extreme weather forecast) and after talking to the crew in the aft bar who warned us that it would a little ‘lumpy’ we made our way up on deck to witness our departure. After slowly departing the Eastern entrance of the port we made our way out into the Channel. 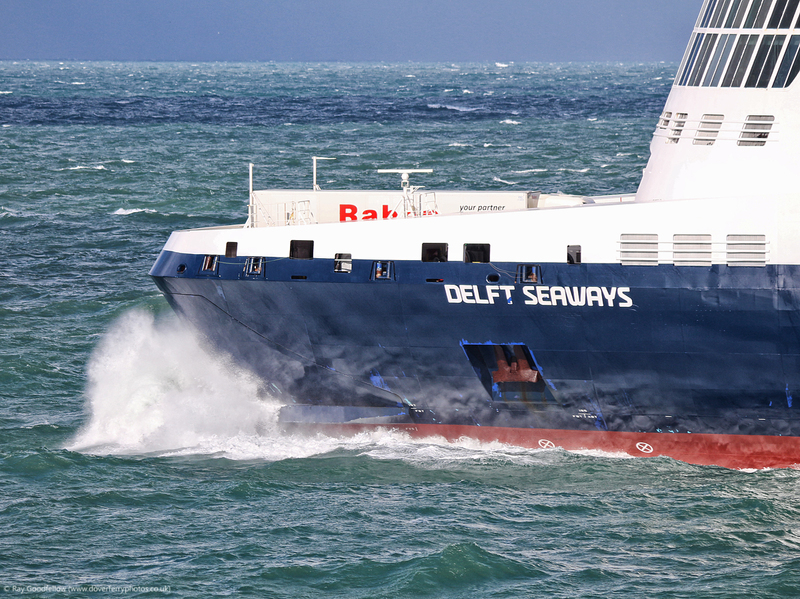 The Calais Seaways was observed inbound to the Port of Dover and she was putting on quite a show thanks to her bow ‘cow catcher’ catching the seas. She passed down our Port side inbound where the two port tugs DHB Dauntless and DHB Doughty were waiting to aid her to the berth. 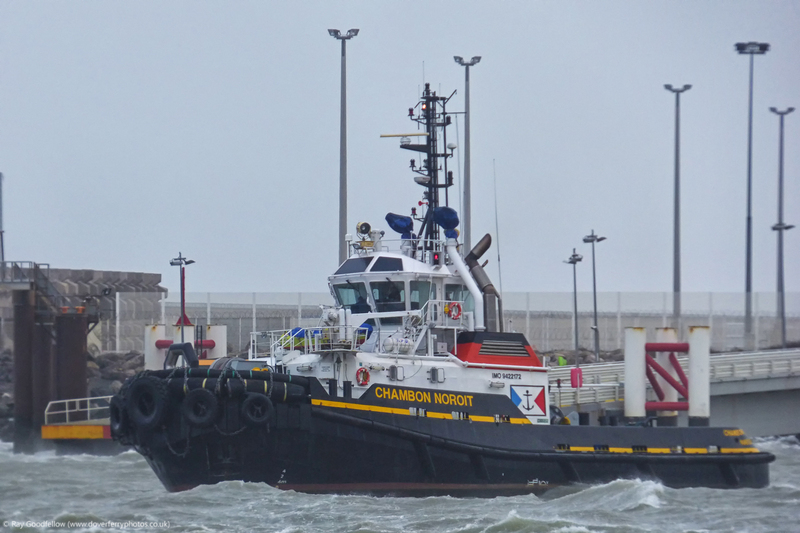 Both tug crews were certainly kept busy during this period of extreme weather. I know I have said it before and I will no doubt say it again but the crews of the tugs really are the unsung heros of the port when the weather is bad. After witnessing the inbound Calais Seaways we headed inside for a cooked breakfast, funnily enough the restaurant was very quiet. 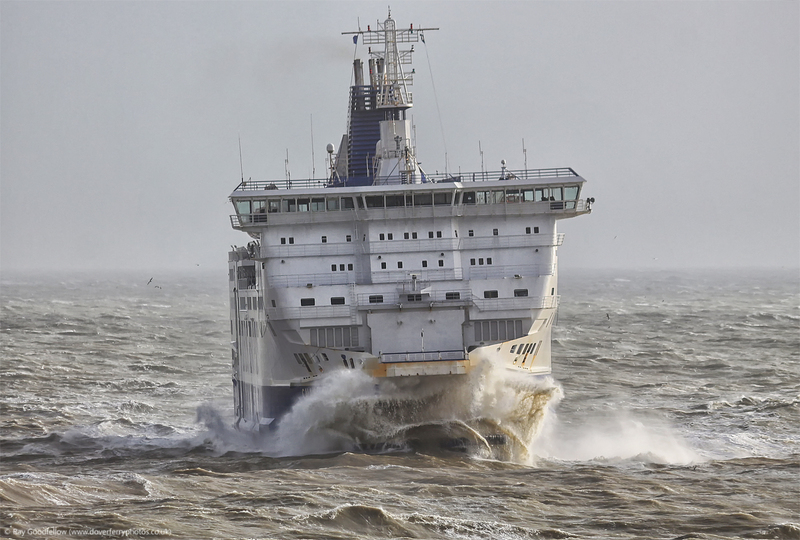 The rest of the journey was spent watching the waves crashing over the bow as we headed to Calais. After a somewhat lively crossing we soon found ourselves under the shelter of the French coast with the wave heights diminishing significantly. 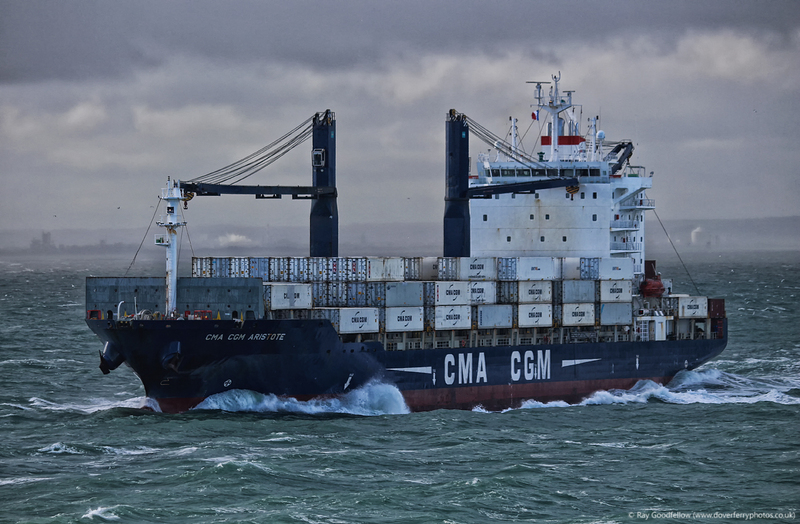 With the seas now behind us we ran up the approach channel to the Port of Calais passing the outbound Pride of Canterbury. After arrival in Calais disembarkation was quite swift and we soon heading out of the port on the A16 towards Dunkerque. 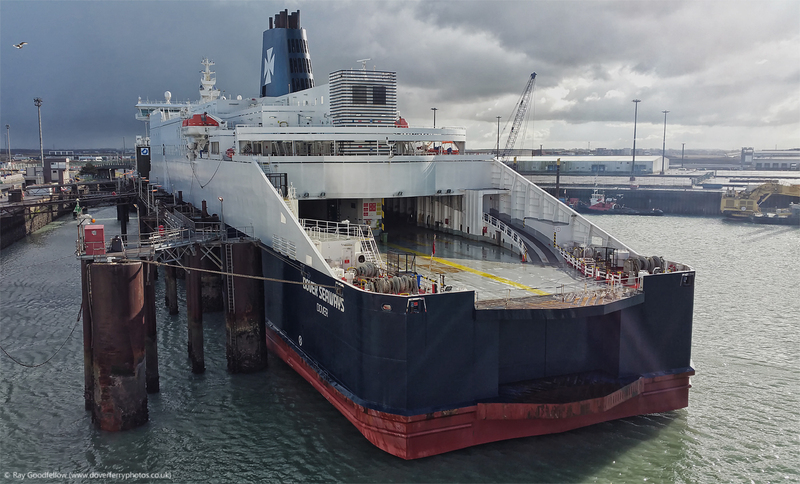 Upon arrival in Dunkerque we headed towards the Damen ship repair yard to get a few photographs of the now complete Côte des Dunes and her soon to be ready sister vessel Côte des Flandres. 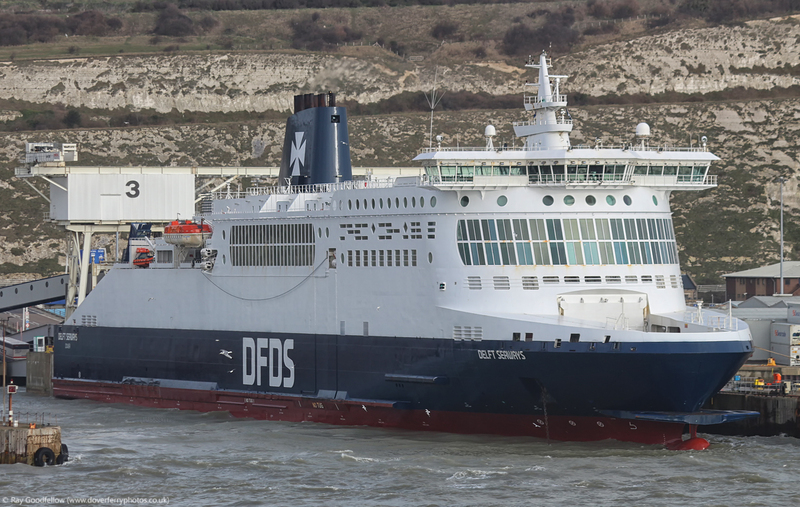 Also whilst in the East part of the port we managed to get a couple of shots of the laid up Nord Pas de Calais and the Newhaven to Dieppe ferry Seven Sisters. 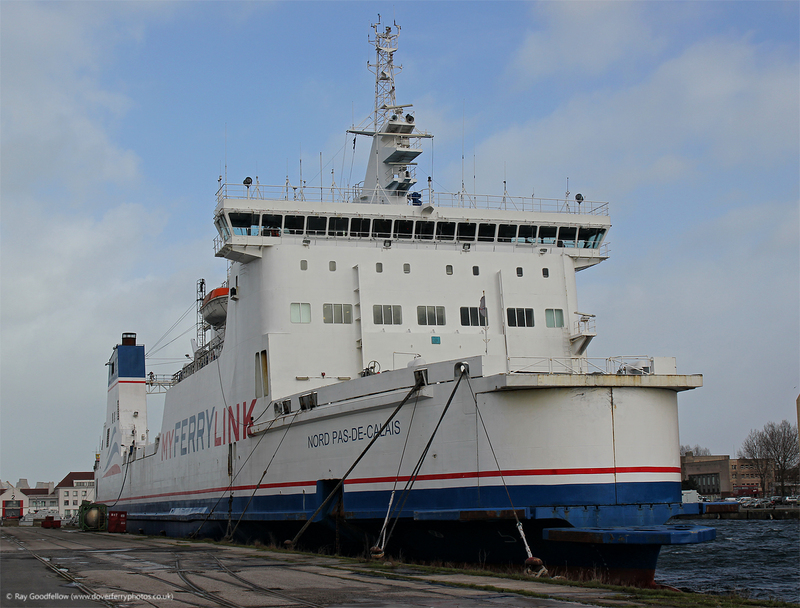 After a pleasant sunny interlude in Dunkerque it was time for us to head back to the Port of Calais for our return crossing to the UK. During the course of the early afternoon storm Imogen’s effects were really starting to be felt across the Southern half of the UK and Northern France. A wave height of 19.1 metres was recorded off the coast of St Ives in Cornwall (that’s about the same height as the Angel of the North) and most channel ferry services West of Dover were cancelled. 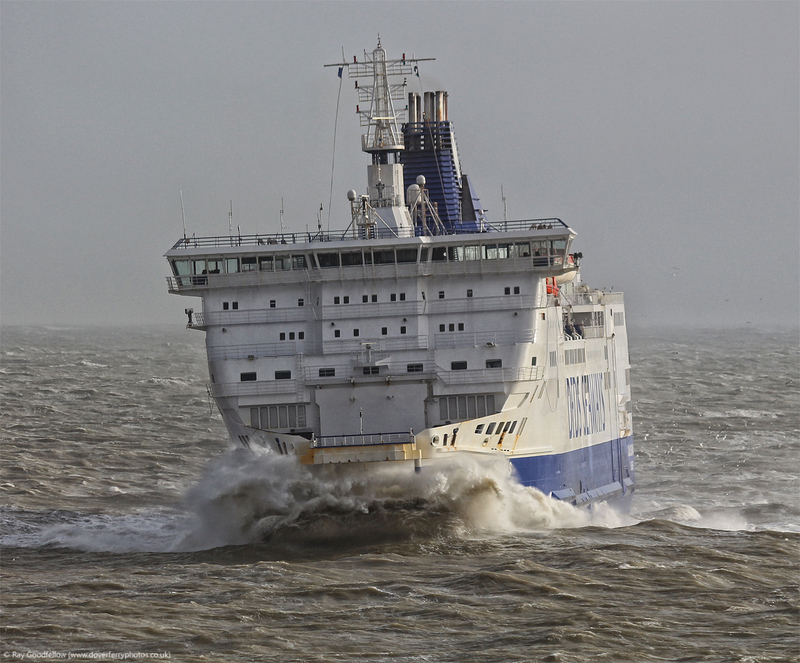 The Port of Calais itself was experiencing gusts of force 11 to 12 with the obvious delays to services now building. 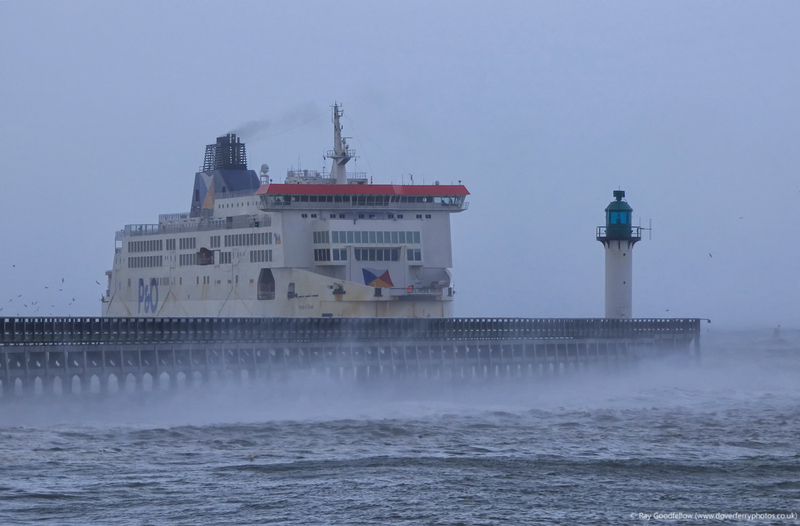 With some time available we headed towards the seafront in Calais to see for ourselves exactly how bad the conditions were. As I am sure many of you already know Calais beach, unlike the beach in Dover, is very sandy and this was being whipped up by the strong winds. Myself and another photographer (my good friend Nigel Scutt) decided to venture out into the weather but that in itself was problematic as it was very hard to get the car doors open! Having finally managed to get out the car we were both swept off our feet and after finding a better position behind a wall managed to get some photographs of the Pride of Kent entering the port. Having been sand blasted and swept off our feet it was all too soon time to head back to the port for our return to Dover. The port was still open despite the atrocious weather but we were warned at the check in desk that there would be an hour and a half delay to our return crossing. The hour and half delay was soon to be a three hour delay and this was due to the number of berths that were available thanks to the wind. 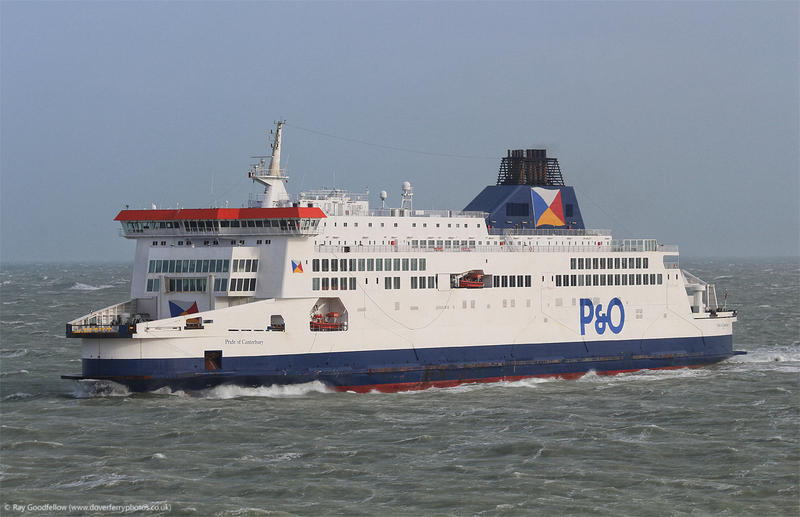 The P&O Ferries marshalling staff in Calais eventually handed out ‘Refreshment’ vouchers which could be redeemed against the cost of food and drink once on board. Eventually after a slightly protracted wait the Pride of Canterbury could be seen heading into the port for berth 6 and we were soon on board awaiting departure to Dover. 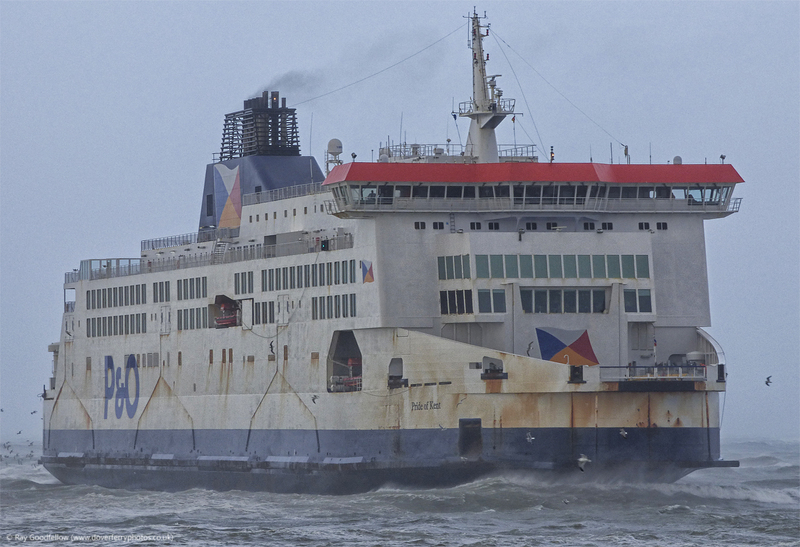 By this time the wind had abated somewhat and the crossing back to Dover was relatively comfortable with the occasional bang as the bow slammed in to the oncoming waves. Upon arrival at Dover it took a good 25 mins to get on the berth but we were soon off and on our way. As I mentioned in my foreword above, the Côte des Dunes herself will feature in a future update so this segment will not be as long as the previous one (thank goodness I hear you say). I am going to cover the outbound trip but not the return. Having experienced the worst of what Mother Nature could throw at us on the previous journey it was nice to arrive at the Port of Dover and find the sun shining ready for our 1015 crossing on the Dunkerque Seaways. It being half term there was plenty of tourist traffic waiting to board the vessel, no doubt heading to the snowier climes of the Alps (judging by the number of skies seen on roof racks). The vessel was promptly loaded and departed on time. 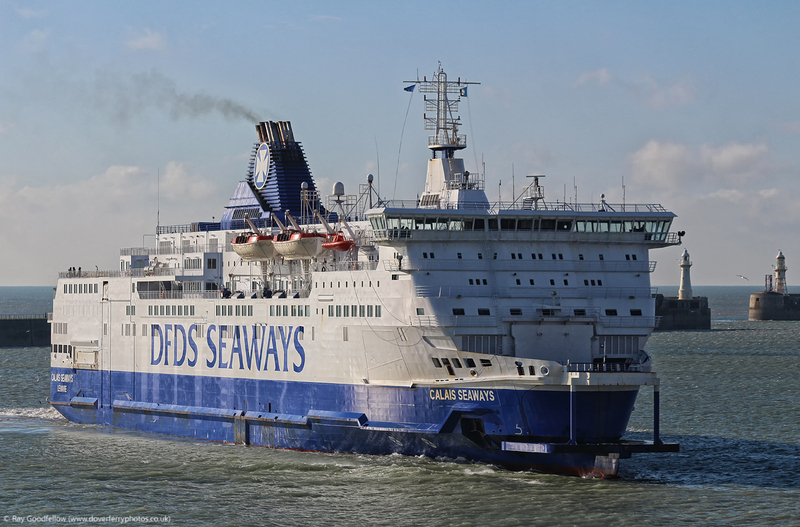 The Dunkerque Seaways along with the other members of the ‘D Class‘ have recently been overhauled at the Damen dockyard in Dunkerque. 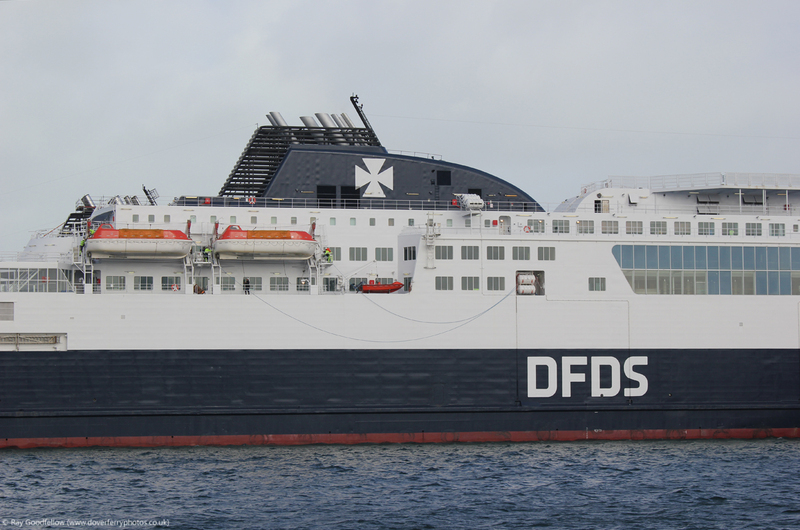 As well as receiving the new DFDS livery they have also had some minor on board refurbishments. To be honest apart from a freshly painted corridor and some changes to the bar/coffee shop I couldn’t really notice that much difference, that said the ship looked and felt a lot fresher than when we were last travelled on her. 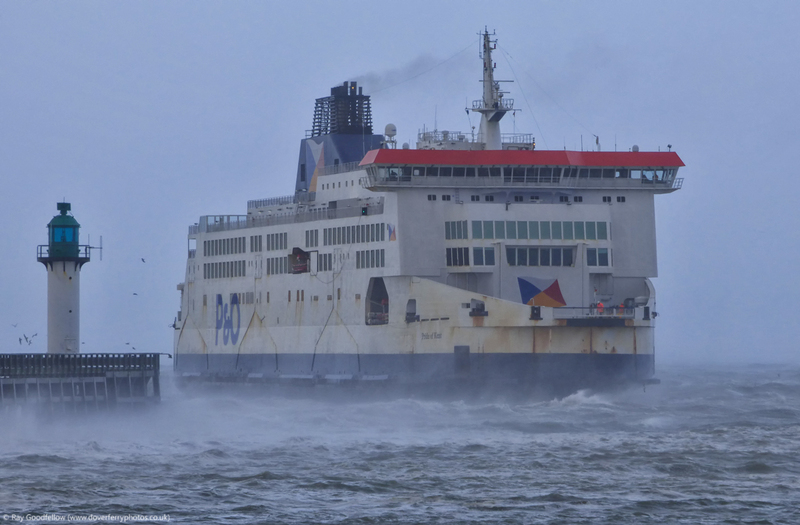 The journey was a little rocky once we were mid channel thanks to some fresh to strong Northerly winds and there were frequent squally showers but the journey passed by without incident and we arrived on time in Dunkerque. 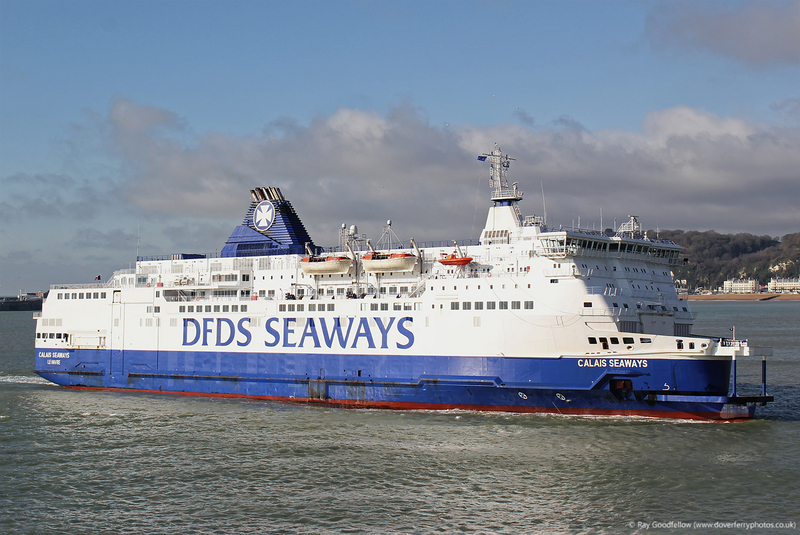 This article and all photographs featured are the copyright © of Ray Goodfellow (Dover Ferry Photos) 2016, All rights reserved. Images posted in this article may not be reproduced or shared without permission. Hello Ray, well a great story and two new ships, it was for me a “déjà vu” when I saw all this, I hope to get someday on one of those ferries crossing to the UK!!! 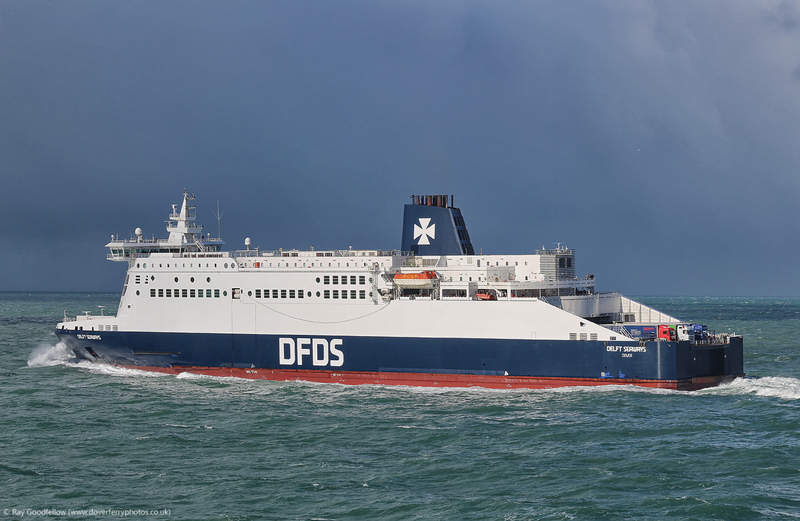 Excellent pictures,,I am a bit of a ferry fan been travelling on them at least two to three times with my car since late sixties,mostly cross to Bilbao and Santander with britteny ferries.just been to Dover cliff top and had an update. Keep up the excellent work.